The deal of the decade is in play as potential suitors for the 60,000 strong collection of the troubled Detroit Institute of Art start to make offers. The Chinese clearly want the Chinese part of the collection and have made 2 offers through the little known Yuan Capital of Hong Kong and the Beijing based state-owned Poly International Auction Room. Other suitors include Catalyst Acquisitions, Bell Capital partners and Art Capital Group. Presumable Qatar must be behind one of the bids or will be lining up a bid. Offers seem to be around the US$1bn – US$2bn mark. The growing interest is because the collection could be worth in the US$10 – 20bn range and the circling sharks smell blood and a huge profit. So far there doesn’t appear to be a Russian suitor but, if President Putin wants to wind up the Americans, there would be no surer way than by putting in a Russian bid. In documents filed in court, FGIC said its financial adviser, Houlihan Lokey, had “conducted an exhaustive examination” of the value of the DIA by examining works in person, reviewing publicly available DIA records, reading books about the museum and discussing the situation with experts. Art Capital Group: Offered a $2 billion loan with the DIA’s entire collection used as collateral. The loan would carry a minimum interest rate of 6% to 9%. A person close to the bid solicitation said the city would likely have to sell some art to pay off the loan. But some of the proceeds could be used to invest in city services and pay off creditors. Yuan Capital: The Asia-based investor offered $895 million to $1.473 billion for 116 specific works, including most of the museum’s most valuable pieces, with funding led by a “consortium” of investors. Poly International Auction: The Beijing-based auction house offered up to $1 billion for the Chinese art collection, although the bid would be conditioned on a review of the specific pieces owned by the museum. “Ignoring the proposals, or failing to cooperate with the interested parties to advance the process, would be another egregious example of the City placing politics over the financial and legal realities of the situation – this would almost certainly result in drawn-out litigation, which no one wants,” Spencer said. Separately, bond insurer Syncora and the city’s retiree committee recently delivered subpoenas to the DIA seeking a massive list of documents detailing the DIA’s collection and finances. Marc Bell, a Boca Raton, Fla., investor said his namesake firm Marc Bell Capital Partners and a subsidiary of his firm, Catalyst Acquisition Group in New Jersey, have offered to buy the museum’s entire 66,000-piece collection for $1.75 billion. Such a deal would probably not close for six months, documents show. Mr. Bell’s firm is known for focusing on mortgage-backed securities, but he also helped produce several award-winning Broadway musicals and plays, including “Jersey Boys” and “August: Osage County.” Mr. Bell, in an interview, said he started collecting contemporary art 15 years ago and owns pieces by 1980s art stars like Keith Haring and Kenny Scharf as well as Dutch graphic artist M.C. Escher. He said he hasn’t yet decided what do with his art trove should the city approve his offer, but he said it could involve a combination of auction and private sales of some pieces, and loans or sales to museums where possible. The other groups offered either a loan based on the value of the art or a sale of part of the collection. Poly International Auction, which offered to spend up to $1 billion for the DIA’s Chinese art collection, is a Beijing-based auction house. Over the past decade, Poly has risen to become an unlikely power broker in the international art world. Controlled by Chinese state-owned China Poly Group, which began as a unit of the People’s Liberation Army, Poly is now the largest auctioneer in Asia and ranks only behind Sotheby’s and Christie’s in terms of total art sales. Less is known about another interested Hong Konk-based entity, Yuan Management, which offered to buy 116 works in the collection, including some not valued by Christie’s last year. Katya Kazakina reports on the surprise move by Detroit’s creditors to milk $2bn from the Detroit Institute of Arts’s by generating asset backed loans. How loans against the art would improve Detroit’s fiscal position is unclear. The additional interest will only add to the city’s future obligations. As with all aspects of Detroit’s bankruptcy, a Federal judge will have the final say. 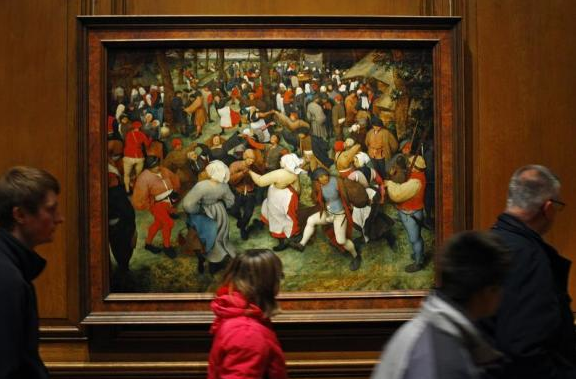 Detroit could get four offers to turn some of its art collection into as much as $2 billion in cash, either as a loan backed by the works or as a purchase, creditors including bond insurers said in a court filing. The creditors today asked U.S. Bankruptcy Judge Steven Rhodes to force the city to cooperate with the potential bidders, who would like to investigate the value of the art. The possible bidders include Catalyst Acquisitions LLC/Marc Bell Capital Partners LLC, Art Capital Group LLC, Poly International Auction Co. and Yuan Management Hong Kong Ltd.
Poly International, an auction house owned by China’s government, seeks to buy all the Chinese works in the city’s art collection for as much as $1 billion, according to court filings. Yuan said it would like to buy 116 works for as much as $1.47 billion and Catalyst said it may be interested in paying as much as $1.75 billion for the entire collection. Detroit Bond Insurers Say City Could Get $2 Billion for Art – Bloomberg. I have chosen an extreme example, which the market is not ready for but which uses many of the skills which are currently available in The Bank. An ailing Midwest City has a major museum which because of the demographic and economic circumstances facing the area, is on the edge of collapse. The City Fathers have made an independent determination that the museum must be kept open as a symbol of the cultural and lifestyle benefits which the city has offered. The closing of the museum would represent the symbolic death of the city. 4. The Bank then proceeds to sell this package as a limited term vehicle, on the capital markets to investors to yield 5% per annum. 6. The purchaser may elect to enter into further discussions with the museum to receive additional art work for extending the term or it may elect to sell the art work and distribute the proceeds. The museum has the advantage of being able to remain open, extending its options into the future and still having its art on display. The Bank has earned fees on originating the deal, offering it to the public and managing the investment vehicle. The investors have benefited by purchasing art at a discount from its true value, earning interest on their investment and having a chance at capital appreciation, should the purchaser take possession of the art and are able to liquidate it at a profit.